Swiss record-setting solar powered aircraft Solar Impulse takes off from Payerne airbase and is to make its first international flight. 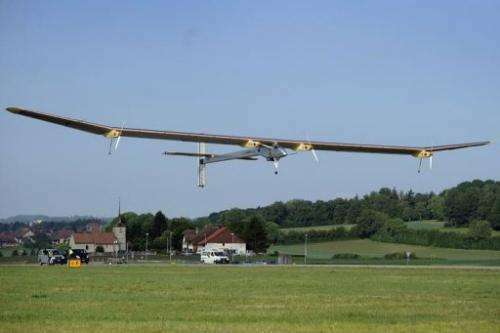 Solar Impulse is due to land at Brussels airport this evening. "The flight is going really well, I have just flown over Liege, it's a real pleasure to enter Belgian airspace," Andre Borschberg said as the dragonfly-like aircraft cruised at 50 kilometres (31 miles) per hour. "The view I have here is extraordinary," the Swiss pilot added in a live feed over the Internet. "I'm above the clouds, for now I'm taking advantage of the blue sky." 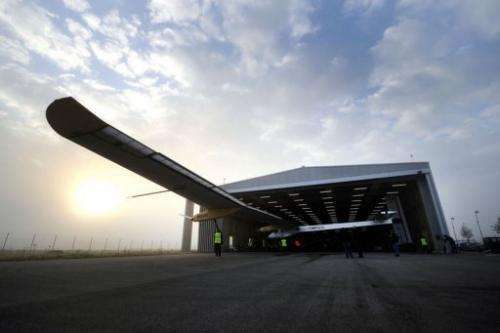 The experimental emissions-free aircraft was scheduled to take just over 12 hours to cover some 480 kilometres (300 miles) from western Switzerland to Brussels airport, after flying over France and Luxembourg at 3,600 metres (11,880 feet), the Solar Impulse team said earlier. The single-seater lifted off gently in clear blue skies from Payerne airbase at 8:40 am (0640 GMT) after being delayed by early morning mist. Swiss record-setting solar powered aircraft Solar Impulse leaves his hangar in the fog prior to takes off from Payerne airbase. Pioneering Swiss solar-powered aircraft Solar Impulse, which holds a 26-hour record for flight duration, took off from Switzerland on Friday on its first international flight to Belgium. The high-tech plane has since flown several times, notably between Geneva and Zurich airports, but the journey to a busy airport at Brussels through crowded airspace is regarded as a new test. "Flying an aircraft like Solar Impulse through European airspace to land at an international airport is an incredible challenge for all of us, and success depends on the support we receive from all the authorities concerned," said Borschberg, who also piloted July's flight. HB-SIA relies on 12,000 solar cells on its 64-metre wings to charge the batteries that provide the energy for the 10-horsepower electric motors driving four propellors. Its record-breaking flight last year demonstrated its capacity to store up enough energy to fly through a summer night. The showcase for green technology will go on display at Brussels airport until May 29 before flying on to the international air show at Le Bourget in Paris from June 20 to 26. "This time, we have a real airplane -- flying -- proof that new technologies can reduce our dependence on fossil energy," said Bertrand Piccard, joint founder and president of the Solar Impulse project. The Solar Impulse team is planning to fly even further, including possible transamerican, transatlantic and round-the-world flights -- in stages -- in 2013 and 2014 using a slightly larger aircraft. Asked about upping the speed, Borschberg said: "That's not the aim of this plane for now." Piccard, himself the first man along with Briton Brian Jones to fly non-stop around the world in a balloon, comes from a dynasty of pioneers. His grandfather Auguste Piccard twice beat the record for reaching the highest altitude in a balloon, in 1931-32. His late father Jacques Piccard was a deep sea explorer, who holds the record for travelling to the deepest point underwater, 10,916 metres (35,813 feet) below sea level in the Marianas Trench in the Pacific. They're not operating on a very large margin of error. Ahh, but they'd be taking off with batteries fully charged, so the margin of error would be somewhat wider. I wonder if it accelerates for takeoff under its own power, or gets towed?